Keel laying ceremony for USS Freedom (LCS-1), 2005. Note the pre-fabricated module in the background. Laying the keel or laying down is the formal recognition of the start of a ship's construction. It is often marked with a ceremony attended by dignitaries from the shipbuilding company and the ultimate owners of the ship. Keel laying is one of the four specially celebrated events in the life of a ship; the others are launching, commissioning, and decommissioning. In earlier times, the event recognized as the keel laying was the initial placement of the central timber making up the backbone of a vessel, called the keel. 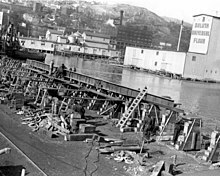 As steel ships replaced wooden ones, the central timber gave way to a central steel beam. Modern ships are now largely built in a series of pre-fabricated, complete hull sections rather than being built around a single keel. The event recognized as the keel laying is the first joining of modular components, or the lowering of the first module into place in the building dock. It is now often called "keel authentication", and is the ceremonial beginning of the ship's life, although some modules may have been started months before that stage of construction. Keel-related traditions from the times of wooden ships are said to bring luck to the ship during construction and to the captain and crew during her later life. They include placing a newly minted coin under the keel and constructing the ship over it, having the youngest apprentice place the coin, and when the ship is finished, presenting the owners with the oak block on which the keel is laid. The tradition of the placement of coins derives from the mast stepping custom of placing coins under the mast and is believed to date back to Ancient Greece or Ancient Rome and were intended to "pay the ferryman" to convey the souls of the dead across the River Styx should the ship sink. 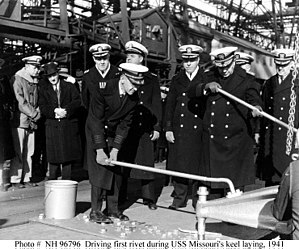 The first milestone in the history of a ship is the generally simple ceremony that marks the laying of the keel. Invitations to the ceremony are issued by shipyard officials, and the ceremony is conducted by them. The builder may be the commander of a naval shipyard or the president of a private company. The ship's prospective name, without the "USS", is mentioned in the invitation, if known; otherwise her type and number are given, e.g., DD 2217. ^ NAVSEA – Naval Sea Systems Command. "Shipbuilding 101". Archived from the original on 2014-03-19. Retrieved 2013-06-06. ^ "Ship Building Milestones". Navy League of the United States. Retrieved 2013-06-05. ^ "Australia: Austal Holds Keel-Laying Ceremony..." NavalToday.com. 8 Jun 2012. ^ "Keel laying ceremony for two Ro-Ro special ships for DFDS A/S". P+S WERFTEN Gmbh. 9 Aug 2011. Archived from the original on October 22, 2013. ^ "Aker Philadelphia Shipyard Holds Ceremonial Keel Laying". American Shipping Company. 7 May 2009. Archived from the original on 14 October 2013. ^ Lenzini, Heidi (January 25, 2013). "Mast Stepping: A Mariner's Tradition | Navy Live". United States Navy. Retrieved May 16, 2018. ^ Office of the Chief of Naval Operations (15 Jun 2001). OPNAVINST 1710.7A – Social Usage and Protocol Handbook (pdf). Washington, DC. p. 9-1. This page was last edited on 27 March 2019, at 19:58 (UTC).